Several diabetes patients end up using insulin for controlling their blood sugar. Most of them have been put on the program of multiple injections of insulin daily. However, even with multiple injections of insulin, majority of patients are not able to control their blood sugar levels. This issue raises a question to physicians whether there are any other possible treatment options which are better off than several insulin shots a day. Perhaps, Insulin pump might be an answer for some of these patients. What exactly is an insulin pump? Who will benefit from using it? Will this be a better option for controlling your blood sugars? Let’s talk about the basic concept of this device. It is a small computerized device that continuously delivers insulin to your body via a small plastic tube. This tube will be attached to a part of your body such as belly or upper arm. The pump is about the size of a pager. You can clip it to your belt or put it in your pocket. 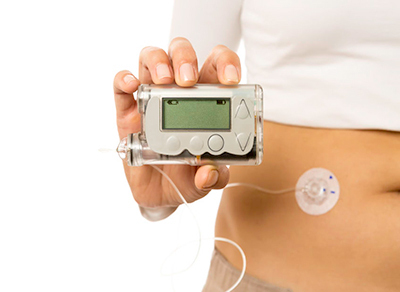 Insulin pump delivers insulin through a small thin plastic tube attached to your body. The tiny end of the plastic tube will be placed under your skin. This will be the site to deliver insulin to your body. The insertion site of the tube has to be changed every 2-3 days. This is obviously less than injecting the insulin shots 3-4 times a day. The pump contains only fast-acting insulin. Patients will receive insulin from the pump in 2 different fashions. First, the pump will give a small amount of insulin continuously all day long. This is called basal insulin to regulate basal blood sugar levels. Second, you need to program the pump to give you an extra dose of insulin based on what you eat and your blood sugar before meal. This is called bolus insulin. Your doctor will program the basal insulin rate and advice you on how to give bolus insulin to match your insulin requirement. When you are on the pump, you should check your finger stick blood sugar regularly as your doctor recommends. However, insulin pump may not be suitable for every diabetes patient. Your diabetes doctor needs to evaluate you and examine if you would benefit from using this device. Before you start using it, you need to be well-trained on how to operate the insulin pump. What are the benefits of the pump? If you are currently using insulin shots, the benefits of changing to insulin pump are as follows. You do not need to inject insulin several times a day. Instead you can program the pump to deliver an extra dose of insulin to your body when you eat or when you blood sugar is too high. The pump may benefit you, if you have difficulty in controlling your blood sugar. For example, if you have frequent low or high blood sugar, swing in blood sugar level, or elevated blood sugar only in the early morning (dawn phenomenon), etc. You will be flexible on when and where you will eat. You do not have to carry an insulin bottle or pen with you all the time. You can program the pump to deliver bolus insulin when you eat. Also, you can operate the pump to stop deliver insulin when you have low blood sugar or when you increase your daily activity such as during your workout. 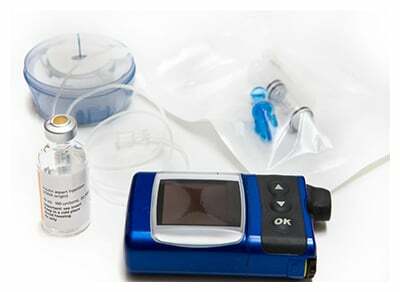 Some types of the pump can make advanced bolus options to deliver meal time insulin bolus over a longer period of time to cover more slowly absorbed food. What are the downsides of the pump? Some individuals may not like the idea of wearing the pump all the time. The cannula of the pump may get caught in clothing. If the tube part of the pump get kinked or slipped, this may stop the insulin delivery to the body and may cause a serious problem if the blood sugar goes too high. The costs of the pump are more expensive compared to multiple insulin injections. Some patients gain weight when using the pump because they are more convenient on eating whenever they want and not watching what they eat. Some people may get local skin infection or reaction at the site of tube insertion. If you are interested in using an insulin pump you should talk to your doctor and get evaluated to see if the pump is right for you. The doctor will discuss the benefits and downsides of the pump with your situation before giving an advice if you are a candidate for one.